1895: Nebraska wraps up a three-game road trip with a 12-4 win over the Denver Athletic Club. 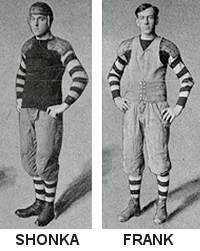 1915: In the first game between the two schools, Nebraska survives a Notre Dame comeback, 20-19, as the visitors miss an extra point that would have tied the game. Many more details here. 1950: Nebraska gets all its yardage on the ground and all its points from Bobby Reynolds in a 19-0 win over Penn State. Also, the state begins charging Omaha station WOW for using the state Capitol as a relay point for its Husker game telecasts. 1965: Nebraska uses a record-setting 95-yard touchdown pass from Fred Duda to Freeman White pull away from Colorado, 38-13. 1970: Nebraska surrenders a record number of passing yards, but it matters little as the Huskers hammer Oklahoma State, 65-31. 1975: Former Husker Tom Pate, a linebacker for the Hamilton Tiger-Cats, dies after collapsing during a game in Calgary. Meanwhile, a goal-line stand in the final minute preserves a 28-20 win at Oklahoma State. 1980: Reserve I-back Craig Johnson rushes for 105 yards and three TDs in a 48-7 romp over Oklahoma State. «1985: Dale Klein ties an NCAA record by hitting all seven of his field goal attempts as the Huskers beat Missouri, 28-20. 1990: With the offense sputtering, special teams provide a needed spark in a 31-3 win over Oklahoma State. 1995: No. 2 Nebraska blows out No. 8 Kansas State, 49-25, holding the Wildcats to minus-19 yards rushing. Also, Lawrence Phillips returns to practice and is scheduled to play in the Nov. 4th game against Iowa State. 2000: The Huskers crush Baylor, jumping to a 38-0 first-quarter lead and cruising to a 59-0 win. 2005: Missouri quarterback Brad Smith piles up 480 yards of total offense, including 246 yards rushing, as the Tigers put away the Huskers, 41-24. 2010: Taylor Martinez passes for 323 yards and five touchdowns and adds 100-plus yards on the ground as Nebraska wins a shootout at Oklahoma State, 51-41.